The Jaguar XK140 Roadster, in my opinion is possibly the sexiest car in the Jaguar line up. 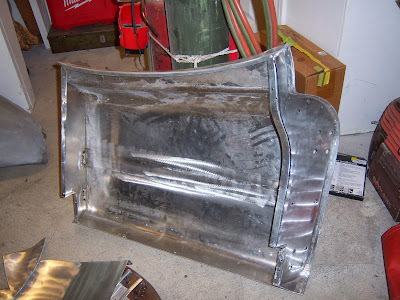 I have the privilege of doing a full body restoration on one that has only about 32,000 miles on it, and the metal is without any corrosion to speak of. 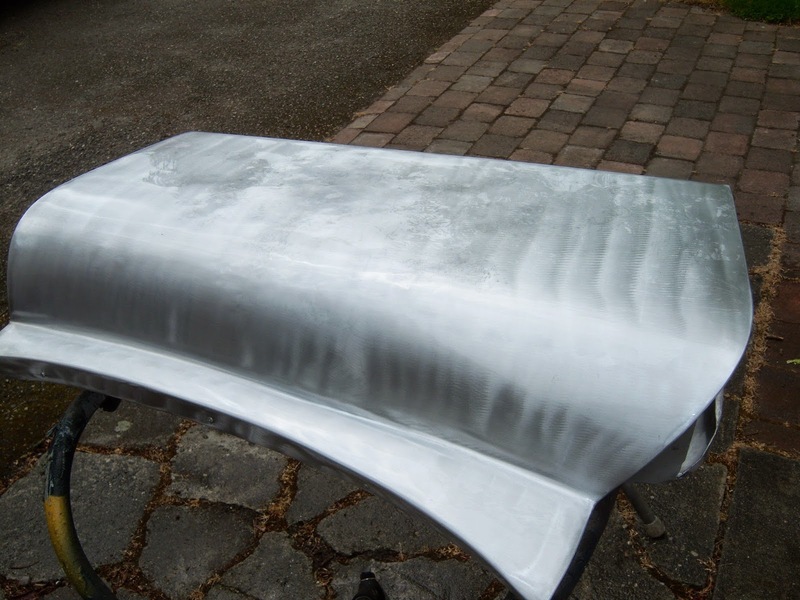 There is a lot of challenging metal work to do on the car, but this one will be without a doubt, one of the finest examples, when finished. We acquired a new door from Jaguar By Jorge, for about $2200.00. The first example was made from .040 aluminum and the welding was hideous. The skin also had a big hollow that was sunk in about 1/2 inch in the middle. I didn't even check the door for the fit because it was so ugly that it was not fit to use on a quality restoration. 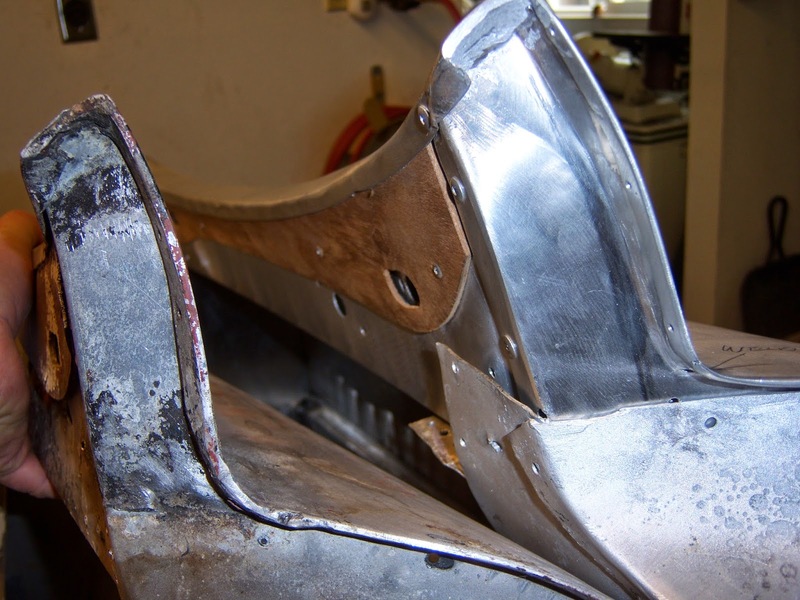 The second door we got from Jorge was a lot better and didn't have the big glob welds like the first example did, but rather, the skin was dimpled at the edge as it was done originally when these cars were built. It was also made from .020 as was original. I will have to shrink the skin as it is bulged out quite a bit, and I have had to reshape the ends of the inner shell panels, as well as remove the top inner so that I could trim about 1/4 inch off the wood in order to allow the panel to be riveted to the upper part of the skin as original. 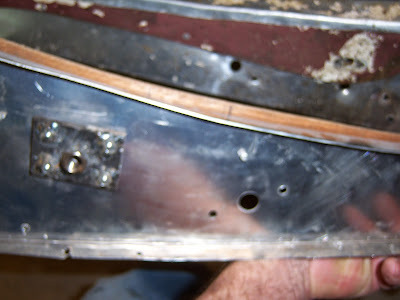 They actually installed two channels up against the inner side of the skin, and tried to glue them with epoxy. 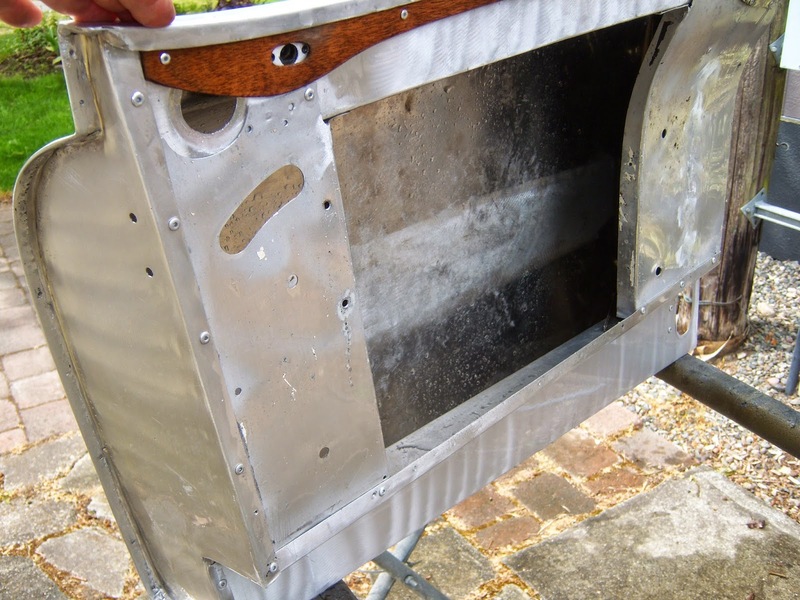 This kind of thing does not work on a panel like this because if it is actually glued to the outer panel it will cause uneven expansion with temperature change as would be the case with the car in the sunshine. A severe distortion issue would be the result. Fortunately, they welded very little of the door compared to the original, therefore I was able to completely disassemble the door by just drilling out rivets. 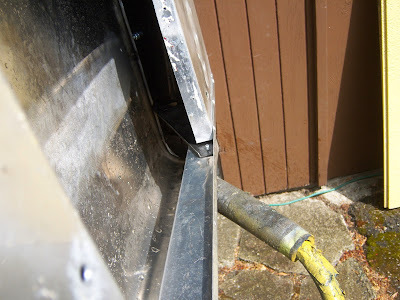 I did have to cut the welds loose on the ends of those channels that were installed and cut in two, one that was integrated with the hinge nut panel that they made. 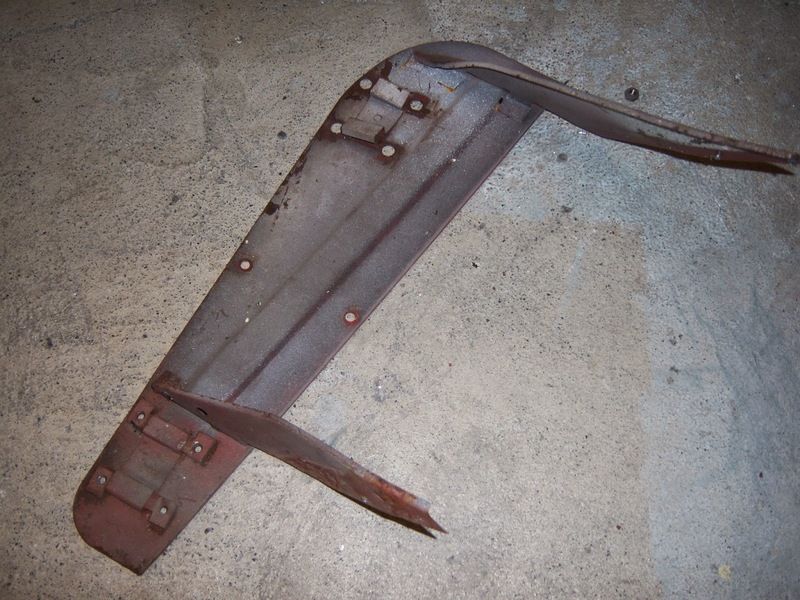 This panel did not have the gusset braces like the original. I am using a lot of the original shell components and discarding a good portion of the $2200.00 door. The parts of that door that I am using are all being reshaped to make them functional. 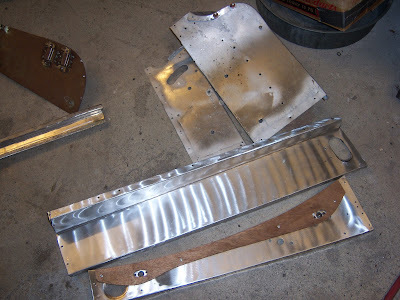 I purchased a rear body panel from Jorge as well. It was unusable, and I returned it and was charged a large restocking fee for that piece of junk. He claims that his parts are "fine for most people" and that I am just one in a million. I feel that a car of this caliber especially, should be restored to a level much higher than a typical ammeter would do in his back yard. I guess I just don't do the type of work that is "fine for most people", as he put it. Let's look at some detail of the project. Discard pile from the new door. Thickness variation had to be corrected. Plywood was more than 1/4 inch too high. Here it is after the clean up and reshaped ends. The original will be cleaned, painted and installed in the new door. 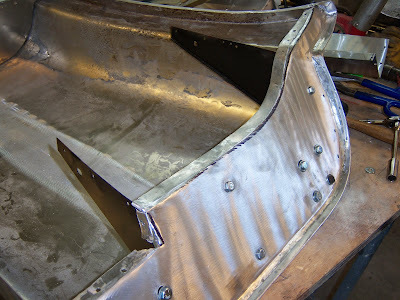 Now the panel has the proper bracing, bolt spacing etc. Some of the new and some of the original parts to be used. The door is now back together and the skin is shrunk down flat enough to surface it properly. It was bulged out about a quarter of an inch. I used four of the original door pieces to make this door usable. Shrinking a .020 aluminum door skin is a two man job. You can't possibly set the torch down and hammer it before the heat dissipates, trying to do it alone. You only have about three seconds to shrink, once you have heated a spot with the torch. 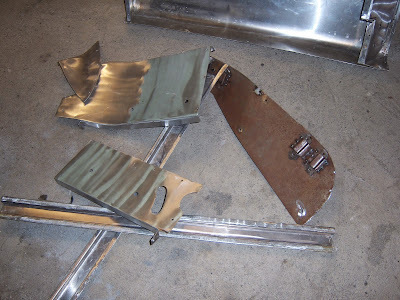 I have the metal work pretty much done on the doors now and remaking a portion of the left front fender to match the front of the new door and to eliminate an old repair that contained three or four pounds of lead.